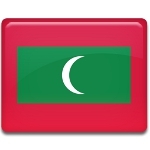 Introduction of Islam is regarded as the cornerstone of the history of the Maldives. Originally Buddhism was the predominant religion in the Maldives. It is unclear how it was introduced into the archipelago. In the early 12th century, however, the last Buddhist king of the Maldives decided to convert to Islam and adopted the Muslim title of Sultan. The conversion may be partially explained by the growing importance of the Arab traders in the region. There also is a legend on how the islands embraced Islam. It is said that long ago the islanders had to sacrifice a virgin girl to an evil sea demon every month. One day a Sunni Muslim traveler named Abu al Barakat saved the next girl selected and helped get rid of the demon. The king was so impressed that he decided to embrace Islam. The venerated tomb of Abu al Barakat is now located in the city of Malé, the capital of the Maldives. Nowadays, Sunni Islam is the state religion of the Republic of the Maldives. According to the constitution, all citizens must adhere to Islam and non-Muslims may not become citizens of the Maldives.